If you talk to breeders, one of their biggest (or at least most consistent) complaints is how difficult it is to find good young-horse trainers in this country. In Europe it’s fairly common to have people that specialize in bringing up the babies, but here they are much fewer and farther between. And while a lot of big name pro riders are good with young horses as well, just as many of them are not. Some of that I think is due to what Katie Prudent pointed out last week, about many of our best young riders only always sitting exclusively on the best horses. Many of our most talented younger riders that we’re producing these days just don’t spend a lot of time on greenies. I think that’s less common in eventing, but something that still probably contributes to the issue. This was especially obvious to me last year at YEH Championships, since we got to sit there all day each day and watch pretty much everyone. Maybe they were just having a bad week, but there were a few that were borderline cringeworthy. Tip: don’t bring the baby horse to YEH Championships in an elevator, especially if you never plan on letting go of it’s mouth. They REALLY don’t like that. It’s probably no surprise that the ones who stood out for particularly GOOD riding were ones that have been involved in YEH classes for a while. Because beyond just knowing the basics of how to properly bring a nice young horse along, the YEH classes themselves are different from a regular event. The judging is different, they’re looking for different things, and they should be presented with that in mind. It seemed like many riders didn’t quite understand how the classes were really judged, or what exactly the judges were looking for. I think that’s the other big issue. All this. They’re looking for all this. From watching a few YEH classes just in Area V, this kind of thing was even more obvious (because, duh, it’s not Championships). 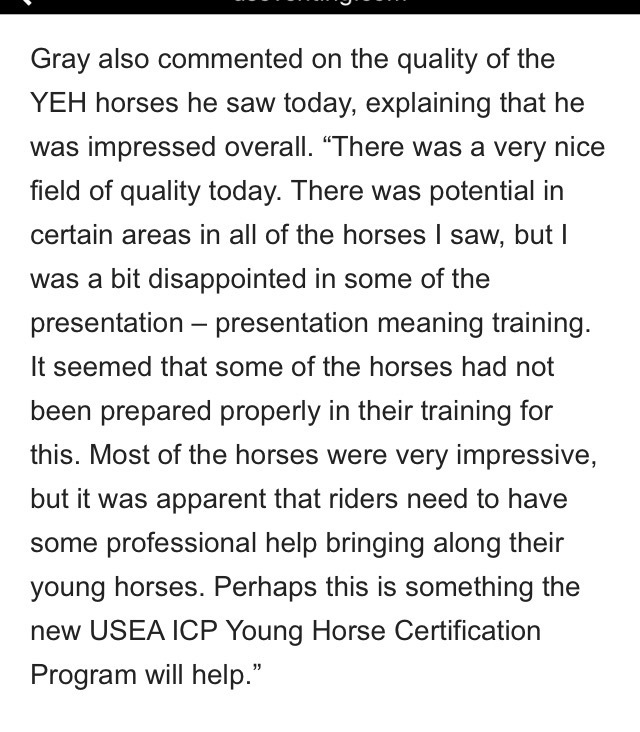 Many seem unprepared, or brought horses that really weren’t what the YEH program is meant for. See what’s written in the General Impression box on the scoresheet? “Potential as a successful 3*/4* event horse”. As a low level amateur, I personally would probably not not try do the YEH stuff myself… but if I had a horse that I thought was potential upper level material AND it was mature enough mentally and physically, I’d absolutely send one through the program with a pro. Holy cow! A list of objective guidelines for eventing dressage?! I was beginning to think such a thing didn’t exist. Lol! The YEH program is really interesting to me. It’s sort of like Materiale in dressage. Really only judging potential, which makes it hard to figure out. Not a set of classes I’ll probably ever take part in (no plans to ever breed or have a world-class baby horse), but I do like watching them to get a feel for the raw talent out there. It’s especially fun if you see a horse later in its career, noticing how much more effect the training and handling seems to have had than the undeveloped ability judged earlier in its life. i don’t know an awful lot about baby horses (next to nothing, actually haha) but i could definitely understand why the typical amateur might have trouble understanding the purposes of these classes. it’s kinda that quintessential tug between sacrificing correctness and training holes in order to get the ‘end result’ more quickly (ie, the end justifies the means) vs a longer view of the developing the talent. which could speak to why young horses are showing up to these events in big bits. but that kinda goes against the whole idea of judging ‘potential’, which seems to be the point of these classes (as opposed to judging competitive ability in the right here and now). in any case, i’m happy to see an increased spotlight on these classes and programs! Luckily I’ve only ever seen a couple of “big bits”… most are in snaffles. But yeah it’s really not a class thats MEANT for an amateur… it’s specifically looking for horses with 3* and 4* talent. Which is the part I think a lot of people don’t realize. i know how brain wiped you guys were last Fall after going to that workshop! I semithought of signing up for it this year but dont know if my brain could hold all that info. It is fascinating EVEN If you never breed a baby horse I think..
Would love to go to one of those clinics sometime. I think you brought up a good point. The series isn’t intended for the amateur or just any horse. I struggle with this series because it seems like they’re asking a lot (especially jump height wise) of young horses. We know hard work at a young age can contribute to serious physical issues. And really…until a horse is out there at prelim or higher you just have no idea if they have the fitness and scope to compete at the upper upper levels. I dunno…I very much agree that finding someone patient with bringing along young horses properly is few and far between! I think whether or not it’s a lot depends on the horse and who’s prepping it. For a talented horse who takes naturally the sport, it doesn’t take much prep and is not far off of what they’d be doing anyway. If the horse has some issues or is a late bloomer, it’ll be a lot more demanding, but this series really isn’t meant for those horses. The humans have to be smart enough to make that call. And for the 4yos who are maybe borderline ready, they now have the option of the FEH 4yo class. I totally agree that riding young horses and babies is a much needed skill. Shane Rose (Aussie champion) breaks and trains racehorses in his spare time (i’m not sure how he has spare time, but anyway I digress) and he is a fantastic rider, especially at the cross country. I have learned so much from my Moo and having a baby off-the-tracker. Your seat has to be spot on! your legs have to be on! you have to be tuned into your horse. no more sitting by the Dressage Arena with one foot basically swung over the wither drinking a bottle of water!.